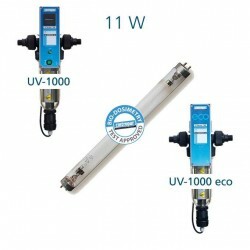 Ultraviolet lamps for water sterilizers: CINTROCLEAR, CINTROPUR UV, KINGLIGHT. UV lamps There are 7 products. 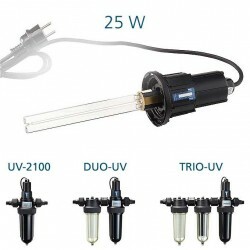 Cintropur 25 watt uv lamp for water purifier models Cintropur UV 2100, Cintropur DUO-UV and Cintropur TRIO-UV. Efficiency for 1 year continuously. Ultraviolet lamp certified manufacturing original Airwatec the strict standards EU and EC guaranteed by Aguagreen. Special price exclusively in the webshop Aguagreen. 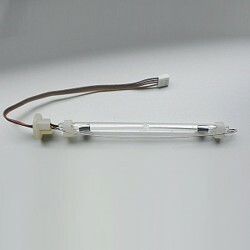 Special Cintroclear 8 watt UV lamp for water purifier Cintroclear UF 500 UV that was manufactured after 2011. Item Number 1707. Length 160 mm. The Cintroclear 8W UV lamp manufacturer's original Airwatec and is guaranteed. Exclusive price in the webshop Aguagreen official distributor Cintroclear. EU CE certification. 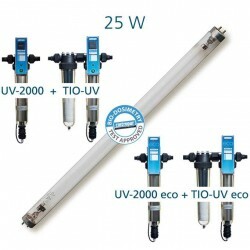 Cintroclear 8 watt UV lamp special for water purifier Cintroclear UF 500 UV that was manufactured before 2011. Item Number 1606. Length 155 mm. The Cintroclear 6W UV lamp manufacturer's original Airwatec and is guaranteed. Exclusive price in the webshop Aguagreen official distributor Cintroclear. EU CE certification. 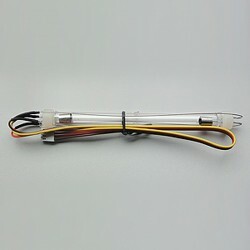 Complete ultraviolet sterilization module for Cintroclear UF 500. 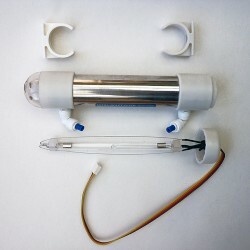 UV lamp 8 watts, integrated quartz sheath, shell, fasteners and connectors John Guest type.